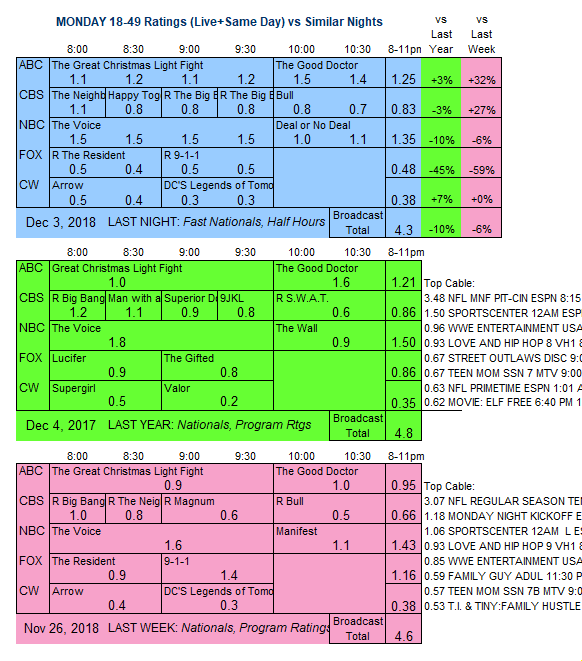 Note: ABC numbers below inflated by local broadcast pre-emptions in Philadelphia on WPVI and Washington DC on WJLA for NFL MONDAY NIGHT FOOTBALL (which also aired nationally on ESPN). NBC: THE VOICE slipped 0.1 to 1.5, and a special DEAL OR NO DEAL was at 1.0, down 0.1 from last week’s MANIFEST. CBS: Returning from a week off, THE NEIGHBORHOOD was steady at 1.1, and HAPPY TOGETHER lost 0.1 to 0.8. After an hour of BIG BANG THEORY reruns at 0.8/0.8, BULL aired its first new episode since November 12 and was down 0.1 to 0.7. CW: ARROW (0.4) and LEGENDS OF TOMORROW (0.3) were both steady. 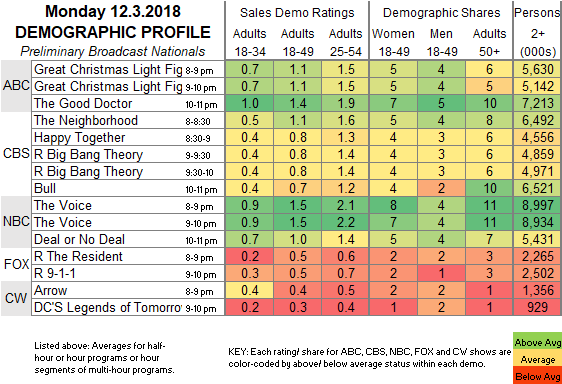 ABC: The current numbers are 1.1 for THE GREAT CHRISTMAS LIGHT FIGHT and 1.4 for THE GOOD DOCTOR. NBC airs an SNL CHRISTMAS special tonight.